Gallbladder cancers (GBC) are some of the most common biliary tract cancers in certain parts of the world with an incidence and prevalence that varies distinctly with region and ethnicity. Certain regions in India have a very high incidence, e.g. Kamrup, New Delhi, with some evidence to suggest that there is a rising incidence of GBC across the country. Multiple international consensus guidelines have been formulated across the globe; however, they generally consider GBC as part of the biliary tract spectrum as opposed to considering it as a separate entity. There is increasing research to suggest that cholangiocarcinomas and GBC have a differing genetic and molecular landscape., This fact coupled with the higher prevalence of GBC in India suggests that these cancers require individual and specific attention to management in the Indian setup. The current document encompasses various aspects of the current standards of management of GBC as well as certain approaches that are being evaluated in the Indian context. India has one of the highest incidence and prevalence rates for GBC across the world, though there are widespread differences in incidences across the country. This geographical variation in the country has been suggested as a causal factor for GBC, beyond the known risk factors (gallstones, chronic inflammation, and infections). Data extracted from population-based cancer registries were used as a basis for a hospital-based case–control study of GBC at Tata Memorial Hospital (Mumbai, Maharashtra, India). In this study, the researchers clearly identified marked variation in incidence with the risk highest in certain districts in the North East (Kamrup) as compared to regions in South India. An odds ratio of 4.82 (95% confidence interval [CI], 3.87–5.99) was observed for developing GBC for individuals born in a high-risk region compared to those born in a low-risk region. There was also an increased risk with increased length of residence in a high-risk region for GBC. Besides geographical factors, genome-wide association studies have also recently identified specific genetic variations in the BCB1 and ABCB4 genes (associated hepatobiliary phospholipid transport) in Indian patients with GBC. Elevated serum carcinoembryonic antigen (CEA) levels (higher than 4.0 ng/ml) or CA19-9 levels (higher than 20 units/ml) could be suggestive of GBC. However, these markers are not specific for GBC and hence must be done as part of the baseline assessment and not for diagnostic purposes. Baseline CA19-9 is best used to guide treatment and follow-up; it may have a prognostic value in the absence of biliary obstruction. Histopathologic diagnosis should be established before any nonsurgical treatment modality; however, this is not essential in patients planned for curative surgery with characteristic radiological features of GBC. 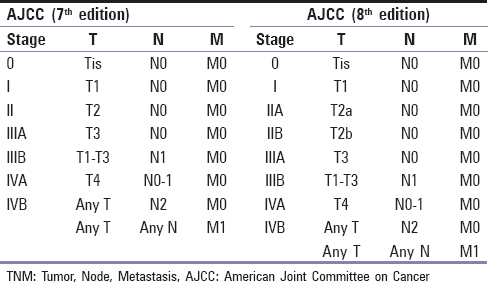 The American Joint Committee on Cancer (AJCC) staging systems for GBC are shown in [Table 1] (AJCC 7th Edition) and [Table 2] (AJCC 8th Edition), with the major changes being the division of T2 disease to T2a and T2b stages and the change in methodology of reporting nodal status (shifted from location to number of nodes). A review of precholecystectomy imaging should be done to determine the location of the tumor in addition to discussing the intraoperative findings with the referring surgeon. Both CECT and MRI provide critical information in restaging the patient. FDG PET-CT scans done 4 to 6 weeks after initial surgery can occasionally be useful to stratify patients with IGBC for further effective systemic treatment. For T1a disease, simple cholecystectomy with negative cystic duct margin is considered sufficient with a cure rate of 85% to 100% and no additional resection is warranted. T1b tumors are associated with an incidence of residual disease of up to 10% and lymph node involvement ranging from 10% to 20%. Therefore, additional radical resection which includes hepatic bed resection (segment IV B and V) and portal lymphadenectomy (stations 8, 12, and 13) are indicated. A similar radical resection is recommended for patients with T2 disease as well. T3 disease has a high incidence of residual disease and metastatic nodes, approximating 36% and 46%, respectively. Management includes radical resection of the gallbladder fossa with portal nodal lymphadenectomy. There is often a need for more extensive hepatic and bile duct resection for the attainment of negative surgical margins. In the case of T4 disease, the role of extensive vascular reconstructions in the treatment of GBC has not been shown to provide a durable survival benefit, and these patients can be enrolled in clinical trials evaluating the role of neoadjuvant therapy. The size of the wedge liver resection depends on the pathologic depth of the tumor and stage of disease, ranging from limited segment IVB and V wedge resections to formal anatomic resections. The routine performance of a major hepatectomy compared with a partial hepatectomy (non-anatomic resection of the gallbladder bed) or a formal segment IVB/ V resection has not been associated with improved survival., A right hepatectomy may occasionally be required to ensureadequate tumor clearance and an R0 resection in tumors involving hepatic inflow vascular structures. Type IV: spread of cancer cells from metastatic lymph nodes. Routine bile duct resection has no impact on survival and is not associated with higher lymph node yield. Unless there is a positive cystic duct margin to warrant additional re-excision, bile duct resection can be avoided. In cases when there is concern, intraoperative frozen section of the cystic duct stump margin can help determine the need for extended duct resection. Extrahepatic biliary tract excision is reserved for patients in the above scenarios or for microscopic involvement of cystic duct margin on intraoperative frozen section evaluation. Routine extended resections in GBC patients are associated with higher morbidity rates. In well-selected patients, the resection of other organs, including the stomach, colon, and duodenum, in the absence of distant metastatic disease, may be resected to ensure R0 resection. The incidence of LN involvement varies by T-stage, approximating 12%, 31%, and 45% in patients with T1b, T2, and T3 tumors, respectively. The presence of N1 nodal disease is not considered an absolute contraindication to surgical resection. At least six lymph nodes should be removed during surgery for accurate staging. The highest peripancreatic lymph node marks the transition between the N1 and N2 fields and has been found to be prognostic. A standard portal lymphadenectomy for gallbladder cancer beyond T1a includes nodes in the porta hepatis, gastrohepatic ligament, and retroduodenal space (stations 8, 12, and 13). Patients may present with symptoms of indigestion, pain, weight loss, jaundice, presence of a palpable mass, as well as nonspecific symptoms such as weight loss, lethargy, and loss of appetite. Patients may also present with signs of migratory thrombophlebitis or with signs of lung/ bone metastases. Tumors limited to the wall of the gallbladder (T1b to T3) are recommended to undergo radical resection, which includes hepatic resection, portal lymphadenectomy with or without extrahepatic biliary tree excision. The goal of the liver resection is to ensure a margin of resection of approximately 1 to 2 cm because there is no serosal surface on the liver side of the gallbladder. The size of the segment IVB/ V resection should be adjusted depending on the pathologic depth and imaging characteristics of the tumor. The standard resection is an anatomic resection of segments IVB and V; however, it is possible to do a smaller wedge resection for early-stage cancers with no radiographic disease in the liver. If a segment IVB/ V resection would result in an inadequate margin, an extended right hepatectomy may be required. Surgical principles regarding lymph node dissection and biliary tract excision in suspected GBC remain the same as described for IGBC. The presence of jaundice suggests malignant invasion of the biliary tree and a majority will have disseminated disease even if it is not detectable on preoperative workup or operative exploration. These patients, therefore, require meticulous preoperative evaluation. The median disease-specific survival among jaundiced patients is only 6 months. These patients usually require en bloc resection of the common hepatic duct/common bile duct and are associated with positive margins in 40%. Although biliary or intestinal bypass can be considered for palliation of obstructive jaundice, stenting through a percutaneous or endoscopic approach is generally preferred as the median survival for these patients is less than 6 months. Drainage of as little as 30% of the liver parenchyma may be sufficient to adequately palliate jaundice and relieve pruritus. Success rates for endoscopic stenting are similar to percutaneous technique but are associated with higher complication rates particularly cholangitis. As a result, in most institutions, an initial endoscopic attempt at drainage is made only if local endoscopic expertise is available. The neoadjuvant approach to initially unresectable GBC is a concept that is gaining ground. Since surgical resection is the only curative treatment available in GBC, there is a suggestion that downstaging initially unresectable tumors after neoadjuvant chemotherapy or neoadjuvant CRT may enable increased numbers of patients to undergo surgery and potential cure. Whereas a number of small prospective and retrospective studies have shown promising outcomes with such an approach regarding increasing resectability, further prospective studies are required to ensure uniform selection criteria for such patients as well as to evaluate actual improvement in survival.,, Investigators at Tata Memorial Hospital (Mumbai, Maharashtra, India) are conducting one such prospective trial, POLCA-GB, with precisely such a mandate. The trial aims to compare chemotherapy alone (four cycles of gemcitabine-cisplatin or gemcitabine-oxaliplatin) versus CRT (RT concurrent with gemcitabine) followed by chemotherapy (two cycles of gemcitabine-cisplatin or gemcitabine-oxaliplatin) with the goal being to downstage initially unresectable GBC and permit potentially curative resection. The decision for adjuvant chemotherapy (and treatment) in the current era should be based on recent evidence as opposed to the data collected over multiple treatment periods. The single randomized control trial by Takada et al., published in 2002, while comprising the entire cohort of biliary tract cancers showed a significant survival benefit for the GBC subset with adjuvant chemotherapy as opposed to observation. However, the regimen used (5-fluorouracil [5-FU] plus mitomycin C) would be considered potentially outdated by current standards. Whereas there was a surfeit of RCTs over the last decade addressing adjuvant chemotherapy for operated GBC, two studies in quick succession with contrasting results over the last two years have helped enunciate management strategies. The randomized phase III trial PRODIGE 12-ACCORD 18 (UNICANCER GI) evaluated adjuvant gemcitabine and oxaliplatin versus surveillance in 196 patients with resected localized biliary tract cancer. Patients were randomized within 3 months of R0 (85%) or R1 resection, lymph node involvement was seen in 36%, and median follow-up was 44 months. Median recurrence-free survival (RFS) was 30.4 months (95% CI, 15.4–45.8) versus 22 months (95% CI, 13.6–38.3) (P = 0.31) suggesting no benefit of adjuvant chemotherapy. In sharp contrast to the negative results of the PRODIGE 12-ACCORD 18 trial, the results of the BILCAP trial evaluating adjuvant single-agent capecitabine versus observation in operated biliary tract cancers (BTC) showed a significantly improved survival with adjuvant chemotherapy (per protocol analysis – 53 vs. 36 months; P = 0.028). The BILCAP study comprised 18% of patients with GBC. While the results of these two large trials are potentially contradictory, current recommendations for adjuvant chemotherapy also take into account the results of the meta-analyses by Horgan et al., Ma et al., and Ghidini et al.,, The meta-analyses specifically suggest a benefit for adjuvant chemotherapy, maximally in patients with R + resections, lymph node positivity, and Stage II and above disease. The meta-analysis by Ghidini et al. clearly identified a weighted mean overall survival (OS) difference between adjuvant chemotherapy and control arms of 4.3 months (95% CI, 0.88–7.79, P = 0.014), with adjuvant chemotherapy reducing the risk of death by 41% (hazard ratio = 0.59, 95% CI, 0.49–0.71; P < 0.001). A specific recommended regimen for adjuvant chemotherapy to be used is yet undecided; however, acceptable regimens would be single-agent capecitabine and gemcitabine-based regimens (single-agent gemcitabine and gemcitabine-cisplatin). Adjuvant chemoradiotherapy is one of the recommended practices in major guidelines., There are no randomized studies establishing the role of adjuvant radiotherapy (RT)/concurrent chemoradiation (CRT) in resected GBC. Data are limited to retrospective series from single institutions and large national databases, with heterogeneity regarding patients with different types of biliary tract cancers (including intrahepatic and extrahepatic cholangiocarcinomas), older RT techniques, nonstandard treatment, and incomplete surgery. Mitin et al. evaluated the outcomes of 5029 patients with T1-T3 N0-1 GBC treated with surgery followed by adjuvant therapy using data from the National Cancer Database of the USA. Adjuvant CRT as compared to observation alone significantly improved the 3-year OS with a hazard ratio of 0.47 (95% CI, 0.39–0.58) in a majority of tumor stages, excepting T1N0M0 tumors. Whereas the extent of locoregional as opposed to systemic relapses in GBC recurrences may be debated, combining chemotherapy with CRT may maximize local control, and reduce distant recurrence. The treatment volume encompasses the tumor bed (porta and resected margins) and the regional nodes such as porta hepatis, peripancreatic, celiac, and paraaortic. The preferred radiation dose schedule is 45 Gy in 25 fractions over 5 weeks (1.8 Gy per fraction) along with concurrent chemotherapy. A boost of 5 to 9 Gy should be given to the region of positive margins while 15 Gy may be given in cases of the gross residual lesion based on normal tissue tolerance., Three-dimensional conformal radiotherapy/intensity-modulated radiotherapy is the preferred radiation technique for reducing normal tissue toxicity. Key concerns while offering radiotherapy to the patients with GBC would be the toxicity to the liver, right kidney, and duodenum/ stomach/ small bowel. The dose constraints to organs at risk are as follows: Duodenum: volume (V) receiving 50 Gy < 10% and volume receiving 40 Gy < 35%, small bowel: mean dose of < 45 Gy, kidney: mean dose < 18 Gy to both kidneys, and liver: V35 Gy < 35%. There are no data to support a single standard follow-up schedule. Follow-up visits may include clinical examination, blood tests (including tumor markers CA19-9 and CEA) and CT scan of chest, abdomen, and pelvis. There must be a physician–patient discussion regarding appropriate follow-up scheduling and imaging. After potentially curative treatment, follow-up should consist of 3-monthly visits during the first 2 years after therapy, followed by 6-monthly visits until 5 years, and annual visits after 5 years of follow-up. The National Comprehensive Cancer Network guidelines recommend imaging every 6 months for 2 years if clinically indicated, then annually up to 5 years. During treatment for advanced disease, follow-up should be conducted at a frequency of 2 to 3 months to allow the best assessment of treatment efficacy or as required for disease-related complications. Most patients with GBC present with unresectable or metastatic disease (70% to 90%). The current standard of care for advanced GBC is palliative chemotherapy using a gemcitabine-based doublet, with cisplatin or oxaliplatin commonly being the accompanying drug. This is based on the seminal ABC-02 and BT-22 trials which compared gemcitabine-cisplatin to gemcitabine, and the trial from All India Institute of Medical Sciences (AIIMS), New Delhi, India, which compared gemcitabine-oxaliplatin to 5-fluorouracil and best supportive care.,, The ABC-02 trial comparing gemcitabine-cisplatin to gemcitabine found an OS benefit for the doublet regimen (11.7 vs. 8.1 months; P < 0.001). The study from AIIMS also showed an OS benefit for the gemcitabine-oxaliplatin compared to single-agent 5-fluorouracil and best supportive care (9.5 vs. 4.6 vs. 4.5 months; P = 0.039). There are no comparative published trials comparing the regimens; usage is essentially individual or institution-based., Patients with an Eastern Cooperative Oncology Group Performance Status (ECOG PS) 0 to 2 may be considered for single-agent gemcitabine, while patients with ECOG PS 3 or 4 may be considered for palliative care alone. It may also be added that patients with ECOG PS 3 to 4 have not been included in the major trials for advanced BTC/ GBC, and the benefit or lack of benefit with palliative chemotherapy in such patients has not been systematically addressed. Besides gemcitabine-based regimens, 5–fluorouracil-based regimens can also be considered in case gemcitabine-based regimens are not feasible. All patients with metastatic or unresectable disease should have access to palliative care concurrent with ongoing chemotherapy. GBCs are a component of the biliary tract cancer spectrum that require specific management in the Indian scenario, considering their high incidence and prevalence. Good quality optimal surgery, avoidance of unnecessarily morbid surgeries, the use of radical cholecystectomy in patients with disease beyond T1a stage, and correct selection of adjuvant therapy are paramount to maximize outcomes in resected GBC. Patients, who have unresectable but non-metastatic cancers, should be enrolled in clinical trials evaluating downstaging approaches with neoadjuvant chemotherapy or chemoradiation. Patients with unresectable and metastatic disease should be treated with palliative first-line chemotherapy with ongoing supportive care concurrently. Sicklick JK, Fanta PT, Shimabukuro K, Kurzrock R. Genomics of gallbladder cancer: The case for biomarker-driven clinical trial design. Cancer Metastasis Rev 2016;35:263-75. Sohal DP, Shrotriya S, Abazeed M, Cruise M, Khorana A. Molecular characteristics of biliary tract cancer. Crit Rev Oncol Hematol 2016;107:111-8. Mhatre S, Wang Z, Nagrani R, Badwe R, Chiplunkar S, Mittal B, et al. Common genetic variation and risk of gallbladder cancer in India: A case-control genome-wide association study. Lancet Oncol 2017;18:535-44. Rodríguez-Fernández A, Gómez-Río M, Medina-Benítez A, Moral JV, Ramos-Font C, Ramia-Angel JM, et al. Application of modern imaging methods in diagnosis of gallbladder cancer. J Surg Oncol 2006;93:650-64. Yeh BM, Liu PS, Soto JA, Corvera CA, Hussain HK. MR imaging and CT of the biliary tract. Radiographics 2009;29:1669-88. Albazaz R, Patel CN, Chowdhury FU, Scarsbrook AF. Clinical impact of FDG PET-CT on management decisions for patients with primary biliary tumours. Insights Imaging 2013;4:691-700. Goel M, Tamhankar A, Rangarajan V, Patkar S, Ramadwar M, Shrikhande SV, et al. Role of PET CT scan in redefining treatment of incidental gall bladder carcinoma. J Surg Oncol 2016;113:652-8. Valle JW, Borbath I, Khan SA, Huguet F, Gruenberger T, Arnold D, et al. Biliary cancer: ESMO clinical practice guidelines for diagnosis, treatment and follow-up. Ann Oncol 2016;27:v28-37. Chun YS, Pawlik TM, Vauthey JN. 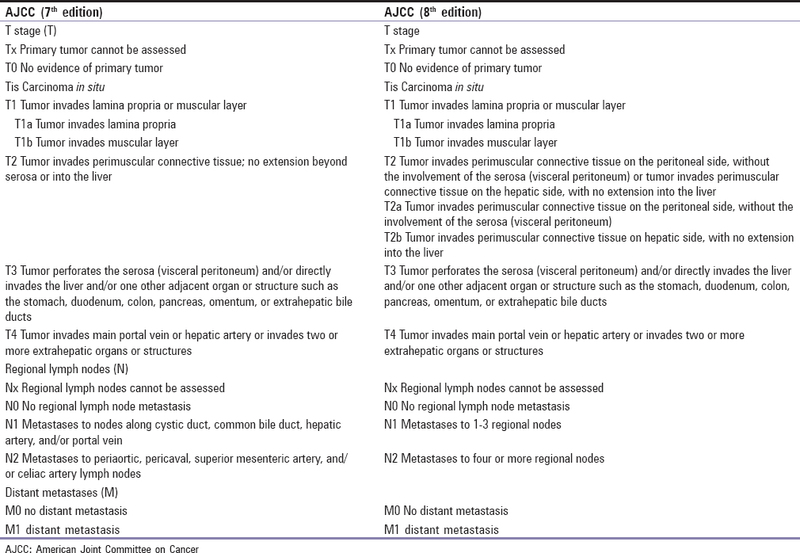 8th edition of the AJCC cancer staging manual: Pancreas and hepatobiliary cancers. Ann Surg Oncol 2018;25:845-7. Pitt SC, Jin LX, Hall BL, Strasberg SM, Pitt HA. Incidental gallbladder cancer at cholecystectomy: When should the surgeon be suspicious? Ann Surg 2014;260:128-33. Butte JM, Gönen M, Allen PJ, D'Angelica MI, Kingham TP, Fong Y, et al. The role of laparoscopic staging in patients with incidental gallbladder cancer. HPB (Oxford) 2011;13:463-72. Goere D, Wagholikar GD, Pessaux P, Carrère N, Sibert A, Vilgrain V, et al. Utility of staging laparoscopy in subsets of biliary cancers: Laparoscopy is a powerful diagnostic tool in patients with intrahepatic and gallbladder carcinoma. Surg Endosc 2006;20:721-5. Shirai Y, Yoshida K, Tsukada K, Muto T, Watanabe H. Radical surgery for gallbladder carcinoma. Long-term results. Ann Surg 1992;216:565-8. Aloia TA, Járufe N, Javle M, Maithel SK, Roa JC, Adsay V, et al. Gallbladder cancer: Expert consensus statement. HPB (Oxford) 2015;17:681-90. Lee HY, Kim YH, Jung GJ, Roh YH, Park SY, Kang NU, et al. Prognostic factors for gallbladder cancer in the laparoscopy era. J Korean Surg Soc 2012;83:227-36. Qadan M, Kingham TP. Technical aspects of gallbladder cancer surgery. Surg Clin North Am 2016;96:229-45. Butte JM, Waugh E, Meneses M, Parada H, De La Fuente HA. Incidental gallbladder cancer: Analysis of surgical findings and survival. J Surg Oncol 2010;102:620-5. Downing SR, Cadogan KA, Ortega G, Oyetunji TA, Siram SM, Chang DC, et al. Early-stage gallbladder cancer in the surveillance, epidemiology, and end results database: Effect of extended surgical resection. Arch Surg 2011;146:734-8. Nigri G, Berardi G, Mattana C, Mangogna L, Petrucciani N, Sagnotta A, et al. Routine extra-hepatic bile duct resection in gallbladder cancer patients without bile duct infiltration: A systematic review. Surg J R Coll Surg Edinb Irel 2016;14:337-44. Ito H, Ito K, D'Angelica M, Gonen M, Klimstra D, Allen P, et al. Accurate staging for gallbladder cancer: Implications for surgical therapy and pathological assessment. Ann Surg 2011;254:320-5. Agarwal AK, Kalayarasan R, Javed A, Sakhuja P. Mass-forming xanthogranulomatous cholecystitis masquerading as gallbladder cancer. J Gastrointest Surg 2013;17:1257-64. Gore RM, Thakrar KH, Newmark GM, Mehta UK, Berlin JW. Gallbladder imaging. Gastroenterol Clin North Am 2010;39:265-87, i ×. Lee W, Jeong CY, Jang JY, Kim YH, Roh YH, Kim KW, et al. Do hepatic-sided tumors require more extensive resection than peritoneal-sided tumors in patients with T2 gallbladder cancer? Results of a retrospective multicenter study. Surgery 2017;162:515-24. Birnbaum DJ, Viganò L, Ferrero A, Langella S, Russolillo N, Capussotti L, et al. Locally advanced gallbladder cancer: Which patients benefit from resection? Eur J Surg Oncol 2014;40:1008-15. Kapoor VK, Pradeep R, Haribhakti SP, Singh V, Sikora SS, Saxena R, et al. Intrahepatic segment III cholangiojejunostomy in advanced carcinoma of the gallbladder. Br J Surg 1996;83:1709-11. Zhao XQ, Dong JH, Jiang K, Huang XQ, Zhang WZ. Comparison of percutaneous transhepatic biliary drainage and endoscopic biliary drainage in the management of malignant biliary tract obstruction: A meta-analysis. Dig Endosc 2015;27:137-45. Takada T, Amano H, Yasuda H, Nimura Y, Matsushiro T, Kato H, et al. Is postoperative adjuvant chemotherapy useful for gallbladder carcinoma? A phase III multicenter prospective randomized controlled trial in patients with resected pancreaticobiliary carcinoma. Cancer 2002;95:1685-95. Edeline J, Bonnetain F, Phelip JM, Watelet J, Hammel P, Joly JP, et al. Gemox versus surveillance following surgery of localized biliary tract cancer: Results of the PRODIGE 12-ACCORD 18 (UNICANCER GI) phase III trial. Clin Oncol 2017;35 Suppl 4:225. Available from: http://www.meetinglibrary.asco.org/content/176861-195. [Last accessed on 2017 Mar 22]. Primrose JN, Fox R, Palmer DH, Prasad R, Mirza D, Anthoney DA, et al. Adjuvant capecitabine for biliary tract cancer: The BILCAP randomized study. J Clin Oncol 2017;35 Suppl 15:4006. Horgan AM, Amir E, Walter T, Knox JJ. Adjuvant therapy in the treatment of biliary tract cancer: A systematic review and meta-analysis. J Clin Oncol 2012;30:1934-40. Ma N, Cheng H, Qin B, Zhong R, Wang B. Adjuvant therapy in the treatment of gallbladder cancer: A meta-analysis. BMC Cancer 2015;15:615. Ghidini M, Tomasello G, Botticelli A, Barni S, Zabbialini G, Seghezzi S, et al. Adjuvant chemotherapy for resected biliary tract cancers: A systematic review and meta-analysis. HPB (Oxford) 2017;19:741-8. Benson AB 3rd, D'Angelica MI, Abbott DE, Abrams TA, Alberts SR, Saenz DA, et al. NCCN guidelines insights: Hepatobiliary cancers, version 1.2017. J Natl Compr Canc Netw 2017;15:563-73. Mitin T, Enestvedt CK, Jemal A, Sineshaw HM. Limited use of adjuvant therapy in patients with resected gallbladder cancer despite a strong association with survival. J Natl Cancer Inst 2017;109. Doi: 10.1093. Mallick S, Benson R, Haresh KP, Julka PK, Rath GK. Adjuvant radiotherapy in the treatment of gall bladder carcinoma: What is the current evidence. J Egypt Natl Canc Inst 2016;28:1-6. Ben-Josef E, Guthrie KA, El-Khoueiry AB, Corless CL, Zalupski MM, Lowy AM, et al. SWOG S0809: A Phase II intergroup trial of adjuvant capecitabine and gemcitabine followed by radiotherapy and concurrent capecitabine in extrahepatic cholangiocarcinoma and gallbladder carcinoma. J Clin Oncol 2015;33:2617-22. Wang SJ, Fuller CD, Kim JS, Sittig DF, Thomas CR Jr., Ravdin PM, et al. Prediction model for estimating the survival benefit of adjuvant radiotherapy for gallbladder cancer. J Clin Oncol 2008;26:2112-7. Hyder O, Dodson RM, Sachs T, Weiss M, Mayo SC, Choti MA, et al. Impact of adjuvant external beam radiotherapy on survival in surgically resected gallbladder adenocarcinoma: A propensity score-matched surveillance, epidemiology, and end results analysis. Surgery 2014;155:85-93. Houry S, Barrier A, Huguier M. Irradiation therapy for gallbladder carcinoma: Recent advances. J Hepatobiliary Pancreat Surg 2001;8:518-24. NCCN Clinical Practice Guidelines in Oncology. Available from: https://www.nccn.org/professionals/physician_gls/f_guidelines.asp. [Last accessed on 2017 Jan 17]. Sirohi B, Mitra A, Jagannath P, Singh A, Ramadvar M, Kulkarni S, et al. Neoadjuvant chemotherapy in patients with locally advanced gallbladder cancer. Future Oncol 2015;11:1501-9. Engineer R, Goel M, Chopra S, Patil P, Purandare N, Rangarajan V, et al. Neoadjuvant chemoradiation followed by surgery for locally advanced gallbladder cancers: A New paradigm. Ann Surg Oncol 2016;23:3009-15. Creasy JM, Goldman DA, Dudeja V, Lowery MA, Cercek A, Balachandran VP, et al. Systemic chemotherapy combined with resection for locally advanced gallbladder carcinoma: Surgical and survival outcomes. J Am Coll Surg 2017;224:906-16. Perioperative Therapy Preoperative Chemotherapy Versus Chemoradiotherapy in Locally Advanced Gall Bladder Cancers – Full Text View – ClinicalTrials.gov Available from: https://www.clinicaltrials.gov/ct2/show/NCT02867865. [Last accessed on 2017 Nov 17]. Okusaka T, Nakachi K, Fukutomi A, Mizuno N, Ohkawa S, Funakoshi A, et al. Gemcitabine alone or in combination with cisplatin in patients with biliary tract cancer: A comparative multicentre study in Japan. Br J Cancer 2010;103:469-74. Fiteni F, Nguyen T, Vernerey D, Paillard MJ, Kim S, Demarchi M, et al. Cisplatin/gemcitabine or oxaliplatin/gemcitabine in the treatment of advanced biliary tract cancer: A systematic review. Cancer Med 2014;3:1502-11. Lamarca A, Hubner RA, David Ryder W, Valle JW. Second-line chemotherapy in advanced biliary cancer: A systematic review. Ann Oncol 2014;25:2328-38. Ramaswamy A, Ostwal V, Pande N, Sahu A, Jandyal S, Ramadwar M, et al. Second-line palliative chemotherapy in advanced gall bladder cancer, CAP-IRI: Safe and effective option. J Gastrointest Cancer 2016;47:305-12. Iyer RV, Gibbs J, Kuvshinoff B, Fakih M, Kepner J, Soehnlein N, et al. A phase II study of gemcitabine and capecitabine in advanced cholangiocarcinoma and carcinoma of the gallbladder: A single-institution prospective study. Ann Surg Oncol 2007;14:3202-9. Gabriel E, Gandhi S, Attwood K, Kuvshinoff B, Hochwald S, Iyer R, et al. Gemcitabine and capecitabine for advanced biliary cancer. J Gastrointest Oncol 2017;8:728-36.